It is that time of year again. 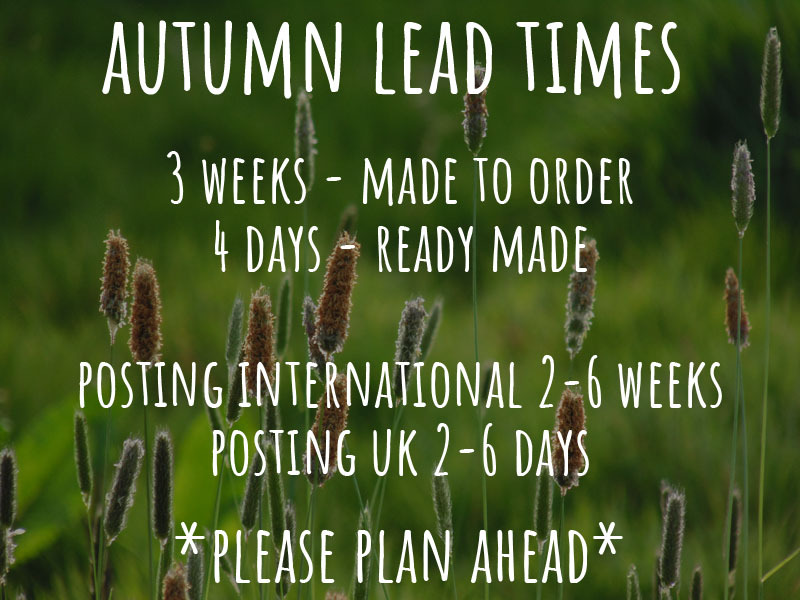 Here are my autumn lead times for 2018. When buying gifts or presents the icon shown by the product cost will show you whether the design is ‘ready made’ or ‘made to order’. Please plan ahead when shopping on Earth Balance Craft. Currently I have a healthy amount of ready to post designs available. View over the ‘ready made’ designs in the store which will be posted out to you within 2-4 working days (plus shipping). Once the current ready made stock has found new homes, I will only be making designs on a ‘made to order’ basis until January 2019. My stock usually sells out, so please plan ahead when thinking of yule gifts and Christmas presents. Many thanks!